I have added Winter’s Tale by Mark Helprin to my favorite novels list along with David Copperfield by Charles Dickens, The Testament by John Grisham, and Home is the Sailor by Jorge Amado. As you can read after that paragraph, I will be writing a favorable review of Winter’s Tale. 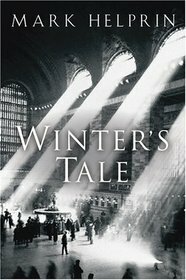 Winter’s Tale is a novel about early 20th Century New York City. It’s a love story, a moral story, a time travel story, and a story of redemption all wrapped together. The novel begins by telling the story of Peter Lake. He is a vagabond and burglar trying to make a life for himself in the great city. His life changes when decides to burglarize a wealthy publisher’s home and sees a woman while he’s doing his job. But instead of robbing the home, Peter falls in love with this woman whom he finds out is the daughter of the publisher of one of the two major New York City Newspapers of that time, the New York Sun. Peter finds out that she is dying of a disease and wants to live her last days with him in love and happiness. Moreover, the novel revolves around the transformation of New York City as it progresses. We get to see the city go through many changes as time marches into the future. These two storylines intertwine to show a depth that balances fantasy and reality into a beautiful novel. I enjoyed reading names of his characters like: Reverend Overweary, Pearly Soames (one of the main bad guys in the novel), Craig Binky, Cecil Mature, and Asbury Gunwillow. Those names had a Dickens-like quality and made me appreciate how fiction should stretch the boundaries of the mundane and take your imagination into a new place. I truly believe that this quality is lost in a lot of modern fiction. It was really refreshing to read Winter’s Tale and I understand a few years ago it was named one of the best novels for the past 25 years by the New York Times Book Review. I know that this type of accolade could set-up future readers for a big let down. But, I have to write that this novel deserved that type of accolade and all the recognition it has received. Please pick up a copy of Winter’s Tale and let yourself enter a world where fiction is not only real, but fantastical and moral as well.